Industrial Marketing Motto? Don't Sell Products, Solve Problems! 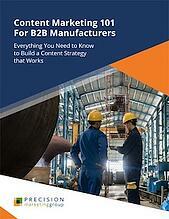 Get all of our most essential content marketing best practices, but with an industrial manufacturing focus. As an industrial manufacturer, your time is short. We get it. You have new products to develop, expensive equipment to maintain, plus tight production and shipping deadlines to meet! Marketing your company may not be top-of-mind, let alone creating a content marketing program for it. And just what the heck is content marketing anyway? Aptly named Content Marketing 101 for Industrial Manufacturers, this introductory guide provides practical and easy-to-understand advice to help you develop messaging that will engage your engineers, fill the funnel, and, ultimately, convert leads into customers! Creating content in varying formats… and more. By incorporating these content cues into your marketing strategy, you’ll quickly become a recognized leading resource for your prospects and customers. Sound good? Simply fill out the form to get the free guide now!